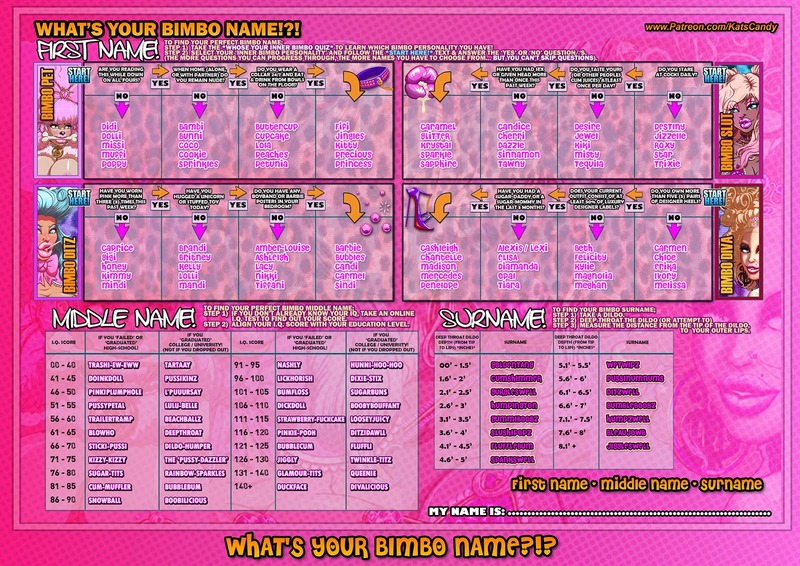 KatsCandy.com Bimbo and Prissy Sissy Art: QUIZ:: WHAT'S YOUR BiMBO NAME?!? Chloe Divalicious Ditzwell. I love it :) More quizzes, please! Yay! This sissy is Kelly Kizzy-Kizzy Ditzwell! This sissy loves your art and thinks you're the best! Thank you Ms. Candy. I love it. Looking forward to more wonderful quizzes, tests, and beautiful artwork. So I took a few weeks off, well kind-of as I still tried to work through the burnout, but failed miserably, so I embraced my need for a short break and over the past month or so I've been slowly Re-Acclimating myself to my work schedule and workload. If i make a 10€ subscribe on Patreon, can i see the older post? And for how many days? By making a pledge of $10 you are pledging towards full-sized *FUTURE VERSIONS of UPCOMING (Full Sized) IMAGES*. I then send out an Email or Message to Each Tier of Patrons where a link is included which contains the Larger and Alternative Versions of the Pin-Ups. The Link stays-up until the first week of the Following Month. My name is Cherry Dickdoll Jiggleswell!! Would luv to actually have this name alot!